Drawing on the riches of the ocean to develop exceptional skin-enhancing products, experts in marine skincare and spa therapies Thalgo presents the Brightening Correcting Serum; a lightweight emulsion that zaps dull, tired skin back to life and targets uneven tone. Sinking and dispersing rapidly into skin, the water-based serum unleashes the multitude of skincare benefits that antioxidant-rich Brown Algae extract has to offer, from hydrating and maintaining skin’s optimal moisture balance to fighting inflammation and firming loose skin. Brightening agents (Hexylresorcinol, Alpha-bisabolol and Papin) work in synergy to neutralise yellow pigmentation, redness and grey skin through soothing, repairing and gentle peeling action, whilst a duo of Hyaluronic Acid and Natto Gum plumps skin for long-lasting hydration. 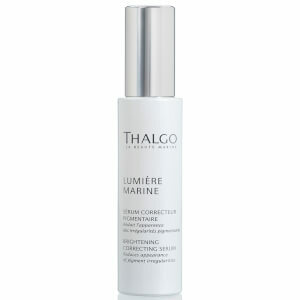 After 7 days, the skin is smoother and the complexion more luminous. After 28 days, dark spots seem less visible, and the complexion looks brighter and more even. Apply to face and neck morning and evening before your daily skincare products. Aqua (Water), Butylene Glycol, Propanediol, PEG/PPG/Polybutylene Glycol-8/5/3 Glycerin, Glycerin, Dimethicone, Hexylresorcinol, Undaria Pinnatifida Extract, Balanites Roxburghii Seed Oil, Maris Aqua (Sea Water), Parfum (Fragrance), Xanthan Gum, Phenoxyethanol, Bisabolol, Pentylene Glycol, Sclerotium Gum, Lecithin, Chlorphenesin, Hydrolyzed Hyaluronic Acid, Pullulan, Hydrolyzed Yeast, Macrocystis Pyrifera Extract, Acrylates/C10-30 Alkyl Acrylate Crosspolymer, Sucrose Palmitate, Ethylhexylglycerin, Tocopheryl Acetate, Silica, Glyceryl Linoleate, Glycine Soja (Soybean) Oil, Sodium Polyglutamate, Algin, Tocopherol, Niacinamide, Terminalia Ferdinandiana Fruit Extract, Adenosine, Sodium Hydroxide, Papain, 1,2-Hexanediol, Caprylyl Glycol, Carbomer, Citric Acid.